1. Whatever Happened to Vileness Fats? *CD only tracks from "The Census Taker"
This is actually a pretty good album. Apparently the video and movie that the music was made for did not fare as well. The video which makes up the bulk of the music on this disk was a half hour black and white short, which, from all the descriptions I've read, made very little sense. But surrealism was always a trademark of The Residents' work. The movie "The Census Taker" was apparently a ripoff of "Eating Raoul". And yes, that is Garrett Morris of "Saturday Night Live" fame on the cover. The music itself, much of it recorded far earlier than the movies they were used in, is exemplary Residents fare, with the usual simplistic but bizarre theme played on strangely manipulated instuments. There was a bunch of people that lived in a village called Vileness Flats near a bridge that was their only way in or out. There were a bunch of intelligent objects that lived on the other side of the bridge. These objects were shopping carts that had drills connected to the fronts of them, and they would harass the people that lived there. They were called the Atomic Shopping Carts. The bridge would keep the carts away, but the villagers hired the Siamese twin tag team wrestlers by the names of Arf and Omega to attack the shopping carts, and when they fight them off, the Bell Boys, a bunch of villains also living on the other side of the bridge, start to come in an steal all of the villagers meat, so they have to live on vegetables. The mayor, who's name is Steve, is in cahoots with the Bell Boys, and when Arf and Omega agree to fight them off, Steve hatches a plan to get the wrestlers go against each other. They end up killing each other off in a knife fight, and Steve, depressed from having dual personalities, throws himself into a volcano. This story, ladies and gentlemen, was being made into a movie, and 14 hours of footage were actually shot in the making of this strange tale. This was not the end of the tale either, but that's how far everything got before that crazy band of eyeballs known as The Residents shut the project down. What we have left, is a 37 minute short film of this story condensed, and a soundtrack album. 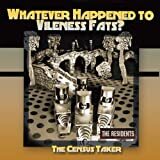 This is a review of the soundtrack called 'Whatever Happened to Vileness Fats?'. 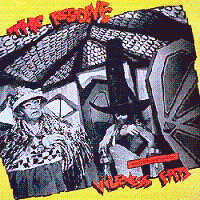 So, in 1984, The Residents were putting out some pretty trashy music. This was not the band at the heights of their music output, but they didn't care. Many times, their music was intended to be awful. So, how do you rate music that is intended to be bad that was attached to a film that was supposed to be stupid? In most cases, this might be tough, but in the case of The Residents, even when their music was supposed to be bad, they actually succeeded in making a great album. Take 'Eskimo' as the best example, or maybe even 'Duck Stab'. Was actually making a good album on purpose or did it happen by accident? This is something I've often wondered when listening to The Residents. So, I rate them on how tough each album is to sit through. This album was made when The Residents were going through their minimal music years. In other words, they used as few instruments as possible, say one single synthesizer. And that synthesizer is played in a very tacky manner. Like someone's grandma is playing it like an old Wurlitzer Fun Time organ and seeing what crazy sounds she can get out of it, but its not your grandma because she is probably more talented. That, and an organ like that is probably worth a lot more money than the equipment The Residents used. That pretty much sums up how this album sounds. Yes, it's tackiness at its worst, and actually quite laughable at some points, like in the track 'The Importance of Evergreen'. There are times when it sounds like, if this was actually orchestrated, that it would actually be quite impressive, but The Residents aren't out to impress anyone, so why bother? That's just it, they don't bother. The problem here, and what makes this album so bad compared to other albums that are considered better, is that this is only really funny one time. And the joke wears thin even at just 37 minutes. But again, The Residents are experts at making things as bad as possible. The music is all instrumental, except for a spoken word section in 'The Importance of Evergreen' and some strange vocal noises in 'Saxophone and Broccoli'. The purpose of the movie was to tell the story in music, which is what The Residents would become much better at later (as in 'Wormwood'). I think the intention was to have lyrics, but they never got that far, as far as I know. I haven't seen the short film, so I don't know if there were even lyrics in that, but I do know that no story is really being told by listening to this album. As time would go on, The Residents actually got better at using synths, and they also went back to using other instruments. Some of their albums actually got interesting again. Don't look to this album as being one of those. The tackiness is funny the first time you listen to it, after that, it's just boring. Oh, it is probably difficult to find too. Some bonus tracks were added later. These bonus tracks come from another soundtrack called 'The Census Taker', which actually did get made into a full- length movie. But the music on that is just as bad as this, so you are just getting bonus tracks of more trash. That was The Residents' intention I suppose. Anyway, none of it is worth looking for. If you are curious, consider this a warning. Don't waste your time. The Residents did succeed in their endeavor in making something totally tacky, but that doesn't mean it's any good. If you just got to have one of their bad albums, just to see how bad it can be, then just get any one of them (I'm not going to list them out here because there are many, just check out their page on Prog Archives). Other than that, this album is only good for completionists. Post a review of THE RESIDENTS "Whatever Happened to Vileness Fats?"